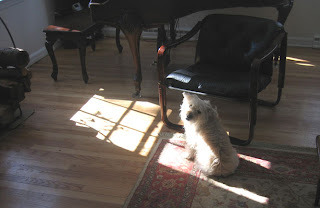 You can find most of my writings these days, including more recent posts on climate, at NewsCompanion.com. Frugaline is pronounced like "gasoline". Before frugaline.org, there was SqueezeClimate.org, which called for squeezing the fossil fuel out of the economy through the squeezing effect of more conservation and more renewable energy. I was glad to hear Obama's Dept. of Energy secretary, Ernest Moniz, use the squeezing metaphor after he was nominated for the position. Of the tabs above, Climate Q&A is helpful for understanding climate change, and the "ShortCuts" lists the steps we took to reduce home energy use by 35% without loss of comfort. I still use frugaline to power much of my life. You probably use some of it, too, without ever having thought of it that way. Scroll through the many posts below to get better acquainted with frugaline in its many guises. New York Times columnist Gail Collins, in a column on climate change today, mentions the ozone layer, an issue often confused with climate change. Holes in the ozone layer, which is high up in the atmosphere and helps protect the earth from radiation, were discovered in the 1980s. Scientists figured out that chemicals--particularly chlorofluorocarbons (takes some practice to figure out how to spell) in refrigerants, and halons in fire extinguishers--were drifting up into the upper atmosphere and eating up the ozone layer, increasing the risk of harmful radiation from space reaching the earth. Regulations limiting the use of these chemicals were quickly passed, and the ozone layer has been on the mend ever since. Climate change, in contrast, is mostly caused by the biproducts of combusting fossil fuels, particularly the carbon dioxide in the exhaust of cars, furnaces, power plants, etc. The carbon dioxide doesn't affect the ozone layer directly, but an internet search reveals there is an indirect link. This from NOAA: "climate change alters the atmosphere’s temperature and circulation patterns, which in turn affect the processes that deplete the ozone layer." In other words, despite effective efforts begun in the 1980s to restore the protective ozone layer high in the atmosphere by reducing use of CFCs and halons, the ozone layer may face additional threats, this time from climate change. Most people are aware that carbon dioxide (CO2) is being pumped into the atmosphere by cars, furnaces, power plants, and myriad other machines, and that the CO2 warms the planet. Some CO2 in the atmosphere is good; too much and the extreme result is Venus, where it's 850 degrees. The cartoon shows a fictional encounter between two tragedies--the sinking of the Titanic and the unprecedented rise of carbon dioxide levels in earth's atmosphere. The graph is a rendering of how the amount of carbon dioxide in the atmosphere has changed over the past 400,000 years on earth. The squiggly red line shows that carbon dioxide levels were fluctuating between about 200 and 300 parts per million until very recently. Each trough, recurring every 100,000 years or so, represents an ice age. The big departure from that repeating cycle happened 200 years ago with the industrial revolution, at which point we started digging up coal, oil and natural gas and releasing all that stowed carbon into the air. The red line surges upward, with carbon dioxide levels having risen 40% due largely to human activity. What's really important to note here is the unprecedented speed of this rise. Even the sharp increases that occurred naturally took 10,000 years to play out, allowing nature time to adjust. We're now expecting nature to adapt to extraordinary changes wrought over a century or two. 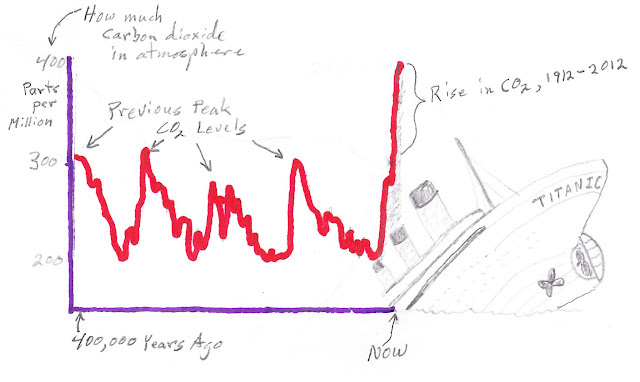 For more info on this kind of graph, google "carbon dioxide record" and then click on "images". Clicking on an image takes you to the associated website. Or take a look at this link. For Titanic aficionados, note that the last smokestack has no smoke rising out of it. The rear-most smokestack on the Titanic was added just for show, to give the impression of greater power and speed. When we reach the point where machines no longer use fossil fuels, and have exhaust pipes just for show, we'll know we've made progress. Though a version of the following essay was first published in the Princeton Packet, it could refer to any town navigating the 21st century in a climate of national and international inaction. In the 1960 musical Camelot, they knew that climate is key to “happy ever-aftering”. With Richard Burton’s voice ringing in my ear, I looked back at the lyrics. “A law was made a distant moon ago here: July and August cannot be too hot. And there’s a legal limit to the snow here, in Camelot.” Some heat, some snow, but not too much--it sounds like a call for moderation, more like New Jersey’s accustomed climate than the shades of South Carolina quickly headed our way. Haven’t you heard? Our 12 months straight of warmer than normal weather are not a fluke, and the increasingly extreme weather events of the past year are what climate scientists have been predicting all along. Surely Princeton thinks itself as congenial a spot as any for happy ever-aftering, yet climate appears nowhere on any list of priorities. When the Princeton borough mayoral candidates were asked at a debate last fall about what Princeton could do to confront the challenge of climate change, the audience snickered. Was the reaction an indication of widespread denial of the problem, or denial of any solution? Probably a mix of both. In either case, human intelligence has been cleverly applied to conclude that nothing need or can be done. It’s understandable that people would feel helpless and even resentful in the face of such a challenge. After all, what can one town do about a problem that is global in scope? Less forgivable are attempts to fabricate doubt about the overwhelming scientific consensus that climate change is real and human-caused. I think of it in moral terms. Morality doesn’t wait for the world to agree, and local action can grow into a much broader movement. A central motivation is that with freedom comes responsibility, and it is deeply unjust that the consequences of our freedom (to burn fuels that will irrevocably and radically change the climate) are posterity’s permanent responsibility. For an example of someone exercising freedom without any accompanying sense of responsibility, consider the captain who ran the cruise ship Costa Concordia aground, risking 4000 lives for the sake of showboating his gleaming machine. The captain, in deciding to steer close to shore, did not factor in the risks of doing so. He apparently ignored the modern navigational equipment on hand, and when the rocks appeared ahead, the ship’s momentum made a rapid change of course impossible. Our navigation of the 21st century shows disturbing similarities to this indifference to risk. The potential downsides of our climate-altering activity abound. The ice sheets perched on Greenland, which are starting to sprout rivers deep in their interior that could lubricate their plunge into the Atlantic, hold enough ice to raise sea levels by 20 feet. Parts of Antarctica, which holds enough ice to raise sea levels 200 feet, could also become unstable. It’s hard to say when ocean acidification, thawing deposits of methane up north, and climate-driven shifts in ocean currents could trigger rapid transformations. As the cruise ship captain discovered, worst case scenarios need to be taken seriously, and momentum can limit options later on. Even if current warming raises sea levels only three feet this century, that would displace the NJ coast 300 feet inland, causing tremendous damage to barrier islands, beaches and accompanying real estate. If you think government is too big now, just wait until it has to intervene in increasingly desperate attempts to save low-lying properties while providing disaster relief for radicalized weather. By opposing government intervention in emerging problems, we insure more government intervention later on. It’s common to dismiss collective action as smacking of socialism, but we act collectively whether we intend to or not. Carbon dioxide derives its power from acting collectively--each molecule absorbing miniscule amounts of heat that, to take an extreme example, has warmed Venus to 850 degrees. Our machines, while serving our needs, pump long-buried hydrocarbons into the air as CO2, in the process collectively increasing earth's atmospheric blanket of CO2 thus far by an astonishing 40%. We ignore the power of collective action, for purposeful good or unintentional harm, at our peril. Princeton occupies a special place in the quest for a safe route through this century. Some of the world’s most prominent climate scientists teach here. As civilization’s lookouts, they’ve offered abundant warning of the trouble ahead, and possible ways to avoid the worst of it. Despite some small, spirited initiatives, the town itself has largely ignored the profound urgency scientific findings imply, demonstrating in miniature the chasm between knowledge and policy that is playing out nationally and globally. In a morally ambiguous age, begin by accepting that machines are simultaneously our best friends and worst enemies. As individuals and as a unified municipality, our goal must be to reduce machine use until more ethical fuels become plentiful. Cultivate ambivalence towards anything needing an exhaust pipe or chimney. Reduce the flow of energy through the umbilical cords that feed our fetal indoor lives. The energy you don’t use now is a generous gift to the future. One little-noted aspect of so-called sacrifice is that one can get good at it, and even find pleasure in a less mechanized life. In the ongoing election of a future, Princeton’s vote is a small one, but more prominent than most. This cartoon video is the most entertaining way I've found to learn about the wondrous nature of carbon, along with the ways carbon is quickly getting us into trouble. It's a five part series, with each one lasting about five minutes. Check out Part 1, followed by Parts 2-5. I'm testing a Wattvision whole house energy monitor on my house. It's made by a company in Princeton, and is straightforward to install by wrapping the sensor around the electric meter outside the house. No need for an electrician. The sensor in the photo can tell when the spinning disk in the meter has made one full rotation. The faster the spin, the more energy being consumed. It then transmits real time energy consumption info to my computer, via the router. This is like a speedometer on your car's dashboard. Some people who have these meters post their home energy use on the Wattvision website, which allows us all to take a peek at how much energy people use in their homes. Use per occupant on the list varies from 1 kilowatt hour per person per day all the way up to 90. That's a huge range in consumption habits. Then there's someone called "Electron miser in NJ" who's blowing us all away, consuming only half a kilowatt per person each day. My family uses about 2 kilowatt hours per person each day, so we're doing pretty well. Since we live comfortably, the range of consumption suggests there's a huge amount of energy that could be saved if people make an effort. For those who like more technical discussions and a look at some of the data the meter generates, the company blog is worth checking out at http://blog.wattvision.com/. One way to save a few bucks a year on energy is to turn off the circuit breaker for your central air conditioner during the cooler months. The compressor has a small heating unit inside (I've heard there's some lubricating oil that needs to be kept warm for optimal performance), which draws energy even in the winter months unless you turn off the power going to the A/C. I discovered this while testing house energy use with my whole house energy monitor, and wasn't able to get the energy consumption down to zero until I tripped the A/C circuit breaker. The heating/cooling contractor told me it doesn't hurt the A/C unit to cut off energy to it when it's not in use. An electrician suggested turning the energy back on a couple weeks before using the unit, to give it time to warm up. It's easy enough to put this on one's electronic calendar for some time in the spring. We've done this the last couple years without any problems. As a disclaimer, I'd encourage double checking with whomever services your A/C unit before doing this. One of the most comfortable houses I ever visited was largely heated passively by a big bank of windows on the south side that let the sun in during the winter. In summer, a broad overhang kept the sun out. Even without such an auspicious design, it's possible to harvest enough sunlight during the day in winter to feel a difference. and can open up or down to control the view while letting solar heat and light in during the day. There's been a real drop in light recycling this winter, compared to winters past. Which is to say that it hasn't snowed, and instead of light getting bounced around on white surfaces, it's been swallowed by the drab browns and grays of a snowless landscape. This impacts the earth's energy budget, as well as our light-starved psyches. Energy secretary Steven Chu encourages people to install white roofs so that sunlight will be reflected back into space rather than absorbed and turned into heat energy. Snow serves that purpose well, when it's around. A light snow also makes an excellent energy detective, telling you where heat is escaping from your house. This roof shows an apparent gap in insulation, where indoor heat escapes and melts the snow on the roof. One of the easier and more satisfying ways to reduce the amount of trash you put out for pickup is to compost food scraps in the backyard. This bucket costs about $20, prevents any odors in the kitchen, and is still like new after 15 years of service. There are many other buckets to be easily found with a google search--plastic, vented, etc.--but I've been happy with this one. Curbside pickup of kitchen scraps and other compostables is an important service to provide for those who can't compost in the backyard. It's upsides are that removing all of a community's compostables from the waste stream can reduce the amount of trash headed to the landfill by 30% or more, and meat scraps that can be problematic for backyard composting can be included in the curbside bin. But even when such programs are offered, backyard composting remains the most ecological approach for those who can, because it removes the energy-intensive mechanized chain of transport/composting/redistribution that comes with curbside pickup. And there's all that rich compost ready for use at the bottom of the pile. The first thing to know about central air conditioning is that turning the thermostat way down doesn't make the house cool down faster. The thermostat is not like a throttle or an accelerator pedal in a car, but instead simply turns the A/C on or off. It matters to know this, because the tendency otherwise may be to turn the thermostat way down in an effort to cool the house quickly, then forget to adjust it later on. The A/C ends up running and running, attempting to cool the house to a temperature lower than you actually want or need. The best thing to do is set the thermostat at the temperature you want. The house will cool just as quickly. A central A/C unit typically draws a whopping 3500 watts of energy while on. I've come to associate the hum of the A/C with the blowing up of mountaintops in West Virginia, which may be the source of coal used to generate those watts. Most people are oblivious to such dramas hidden behind the facade of everyday domestic life. The second thing to know is that ceiling or floor fans, which only use 20 or 30 watts of electricity while running, can help you cut back on A/C use. What we've found, as we progressively try to trim the use of A/C in the house, is that it's possible to gain enough comfort on hot days by using a mix of ceiling fans and A/C, with the A/C on just enough to lower the humidity in the house. Of course, when the A/C is running, all the windows have to be closed. Otherwise the heat and humidity from outside just pours right back in. Our central A/C system, while not the worst, is not exactly state of the art. It pushes coolish air through a labyrinthine system of ducts, and sometimes labors to bring the house temperature down below a certain point. With the thermostat set at 81 on a 95 degree day, it cuts the humidity nicely, then turns off. The fans do the rest. Set it at 78 and it may lumber on for long periods without achieving much gain in comfort. Some may think 81 sounds a tad high, but fans are said to make it feel 4 degrees cooler, and over time our bodies have grown accustomed to a broader range of temperatures. A little bit of adaptation now could save a lot of adaptation later on. A couple degrees adjustment of the thermostat, then, can make a big difference in how much the A/C runs. If it's running constantly, try nudging the thermostat upwards to give the A/C, and the planet, some relief. Wear shorts and t-shirt, or something similarly light, and let the fans do the rest. We're back in the kitchen here, for another segment of Climate Change Cookery. For most of my adult life, I have been a passive lover of beets. Passive in the sense of eating them only when they present themselves in a prepared form--at a salad bar or in a pickle jar. I took their red color to signify the presence of important nutrients not necessarily present in other foods. It never occurred to me to cook them myself until recently, and immediately a serious obstacle presented itself. They take a long time to cook, and in the middle of summer, in the middle of the unfolding climate change debacle, it's hard to contemplate boiling anything on the stove for long periods, or firing up the oven. Hot house, hot planet. All of this was solved by friend Dorothy, who served a delicious raw beet salad at one of her dinners. Recipes can be found easily on the internet, but an improvised approach involves peeling and grating the beets, adding some olive oil and an acid like vinegar, lemon or orange juice, and throwing in some chopped parsley, ground up nuts, and something oniony like chives. Some recipes call for goat cheese. Another friend added corn and grated carrots to expand the nutritional aspect. It's late spring, the weather is warming, and it is time for timeless rituals of the season to unfold at this household. Screens, taken off last fall to allow more sunlight in through the windows, follow traditional (two year old) migration routes up from the basement. The last of the cured firewood is burned in the wood stove on still cool mornings. And the cold water that at least one of us uses to handwash dishes--on the premise that water that isn't hot enough to kill germs only makes them stronger--feels more pleasant. The hot water heater gets turned down a notch, so that it's just hot enough to deliver a comfortable shower without any dilution from the cold water tap. Showering styles remain stubbornly diverse, from lengthy dousings, passionately defended by the resident teenager, to the navy approach of turning the water off during scrub downs. The house cruises through late spring without the aid of furnace or A/C, sustained through cool nights by a reservoir of heat absorbed during the day. Its ballast of cool air in the basement keeps it steady through brief hot spells. Trimming shades and windows is all we need to do to keep this ship on a steady course of comfort. We'll reach the tropics of summer before long, but for now it's possible to make comfortable headway across the seas of time without the help of machines. It's easy to be fooled by CO2. Odorless, invisible, a benign part of every breath--what harm could possibly come of pouring more of it into the atmosphere? According to my notes from a talk at Princeton University by Michael Oppenheimer, the extreme heat of Venus, and the extreme cold of Mars, are not so much a matter of their distance from the sun but of how much CO2 is in their atmospheres. Venus has a very high concentration of atmospheric CO2, while the concentration on Mars is very low. A quick check on the internet yielded the following: Venus has temperatures approaching 900 F, while the surface of Mars rarely gets above freezing. In other words, the amount of CO2 in the atmosphere has everything to do with whether a planet is too hot, too cold, or just right. Recessed lighting can be a wasteful way of lighting rooms in your house. If they are on dimmer switches, and/or use halogen lights, they can be expensive to retrofit with compact fluorescent bulbs (CFLs). A friend recommends the following approach to reducing dependence on recessed lighting, while still having a pleasing light. "My solution at home is to keep the halogens dimmed and use large CFLs in torchiere style lamps for the primary lighting in those rooms." Seek out the torchiere lamps that use compact fluorescent bulbs rather than the potentially dangerous and less efficient halogens (they get very hot and could start a fire if the lamp is knocked over). One way to cut back on energy use is to air dry the laundry. This works for most clothing, and may actually reduce wear and tear, since the lint in the dryer is evidence of loss of fibers when clothes are machine-dried. But the scratchiness of air-dried towels has not gone over well in our household. 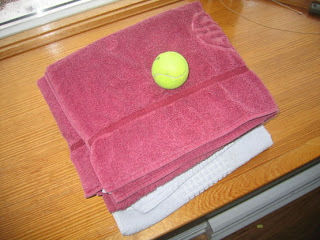 One trick I've heard of is to air-dry towels, then put them in a dryer with a tennis ball or two, using the unheated fluff cycle to soften them up. Worth a try. One can actually buy specially designed balls to use in the dryer with wet clothes. They reportedly speed the drying. Dogs know where to find comfort. Most homes, like this one, bathed by solar radiation in the winter, spurn most of that free heat. You'd think that home designers would have widely exploited the way the sun conveniently bends down low in the winter, sending light and heat streaming deep into a room through any welcoming window. But instead, passive solar homes are a rare exception. Blame the usual suspect: cheap energy. We try to make our house as welcoming to the sun as its standard design allows, making sure the shades are up during the day and the screens stored in the basement. 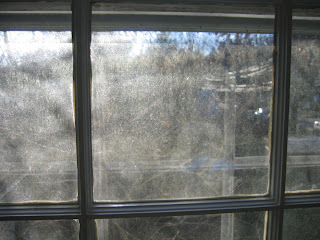 Most years, I get around to cleaning the windows in the fall. The combination of metal screens and dirt on the windows can reduce how much sunlight gets in, which this window illustrates all too well. On a sunny afternoon, the greenhouse effect is noticeable, warming the house and giving the furnace a rest. Glass windows let the energy from the sun in to the house, but prevent the reflected energy from escaping. (The reflected energy is of a different wavelength.) If we could make more use of the greenhouse effect in our homes, we'd leave less of a legacy of greenhouse gases in the atmosphere. In the summer heat, there are many ways a house conspires to make itself even hotter. Here are some ways to cut back on the house's heat production and reduce the need for the A/C. Most of these are minor, but their effect can add up, and they include savings of their own. I claim no expertise, only some experience and a willingness to experiment. Lower the temperature of your water heater to a temperature that, when you turn on the hot water for a shower, there isn't any need to dilute it with water from the cold tap. This simplifies showering as well as reduces the work your water heater needs to do. Turn off the heating element in your refrigerator that heats the door (supposedly to reduce condensation on the door). If your frig has one, the button should be inside near the back, where the light bulb is. Use as low-wattage a light bulb in the frig as you can. Our older frig had an incandescent bulb inside that gets searing hot during prolonged open door meditations on what to eat. This is a perfect spot for a LED light, which would not emit much heat, but they aren't available as far as I can tell. Minimize the use of incandescent and halogen light bulbs, which get very hot. Many of these can be replaced with fluorescents without sacrificing the quality of light. When boiling water for tea, boil only as much water as you need, so that less heating is needed and unused hot water doesn't sit on the stove, heating the room. Or heat the water in a microwave with the bag inside. We usually associate attic insulation with keeping heat in during the winter, but attics can turn into cauldrons in the summer, and abundant insulation helps keep that heat from seeping into living spaces. Humidity in the house can be affected by the yard's topography. If the ground is sloping towards your house, rain is more likely to seep in next to your foundation and add humidity. Within four to six feet of the foundation, the ground should slope away. My house inspector told me it's okay to pile dirt against bricks, but not against wood siding. Whole house fans: Very helpful, but ours is overpowered, which means it overwhelms the vents in the attic. The resultant high pressure actually pushes attic air down into 2nd story rooms. Not good, so having attic ventilation and fan power balanced is important. One thing that has worked well is to have a window fan that runs overnight, progressively cooling the house. Closing up in the morning as the day starts to heat up keeps the cool air inside. I can't explain why, but we wash our dishes by hand. Maybe a bit of hand labor is relaxing; maybe the older dishwasher's noise and slowness is bothersome; maybe it's stubborn habit. It's been reported that handwashing can be more wasteful than using a newer model dishwasher, but so much depends on style. My wife uses the Niagra Falls method, in which hot water streams out of the faucet constantly until she's done. I use cold water in bursts, making sure the dishes are wet first to soften the dirt and minimize the work. We don't use a tub, but instead put dish soap directly on the sponge. No outbreaks of the plague have been reported due to my cold water method, and in summer the cool water is a welcome feeling. Even if a little more water is used in handwashing, bypassing a dishwasher saves a lot of energy and heat production. One of my moments of environmental awakening came as I found myself driving my car four blocks to a town meeting on sustainability. The irony of the situation struck two blocks into the drive. Why was I using a car to transport myself four blocks to a meeting whose main purpose is to figure out how we can become less dependent on fossil fuels? As it happened, I was running late, and there was a light mist that could turn into rain--two factors that make me instinctively grab the car keys. I immediately parked the car and walked the rest of the way. To my surprise, the precipitation did not penetrate my clothes. Since then, I have gradually expanded my tolerance for biking in mist, or drizzle, or even sometimes rain. This morning, for instance, a misty moisty morning, I taxied my daughter to school on the trailer bike, and found the mist to be even enjoyable. Another time, when the mist turned to rain while heading home, we experienced an unexpected euphoria. There can be a certain laboriousness to riding a bike, but it can also bring a sense of awakening, of being more alive. 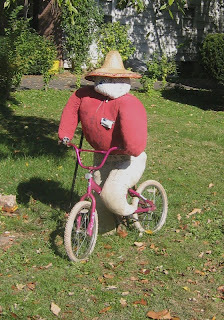 As you can see, now that everyone is feeling an urgency to do something about climate change, even the neighborhood lawn ornaments are taking to their bikes. In fact, if people are changing their ways, it's hard to tell from this outpost, where the stream of cars passing by appears unabated. Even living right in town, where the shopping center is four blocks away and schools are a ten minute bike ride, there always seems to be some excuse to jump in the car. Maybe we're running late, or the clouds are threatening, and besides, it's just a short drive, not much gas consumed, so no harm done. People are faced with a double abstraction: that the oft-declared global emergency of global warming will dramatically affect each of us and all we care about, and that our individual actions can actually affect the course of global warming. Though government can have an influence, the human impact on the planet comes down to the cumulative effect of individual actions. As individuals we feel peripheral, inconsequential, but are in fact central--the only show in town. Self-denial is not in the national psyche, so any change in individual behavior needs to be driven by positive, self-actualizing factors rather than a willful forgoing of comfort and convenience. Tipping the balance towards jumping on a bike, rather than crawling yet again into the stylish metal hulk, requires a cumulative change in thinking, until the pros of riding a bike in any given situation start to outweigh the cons. It helps to be aware that short, in-town drives are not good for a car, since the engine never quite warms up. The $50 refill at the gas station the other day was a fine wakeup call. For those who can connect the dots between personal action and the nation's future, it's also possible to view walking and biking as patriotic acts, a way to incrementally reduce all sorts of undesireables: dependence on foreign oil, the national trade deficit, gas prices and inflation. There's also the unsettling thought of what sorts of corrupt regimes all that gas money is supporting. Factor in a desire not to add to global warming, air and water pollution and the congestion of local roads, and before you know it the sway of your thinking has you on your bike, feeling empowered to change the world in some small way, immersed in the richness of the great outdoors, improving your circulation as you circulate through town. 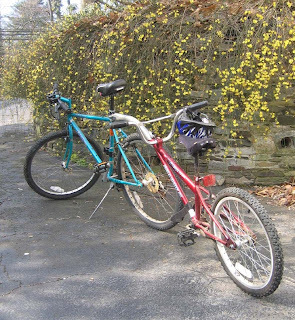 The more one chooses the bike over the car, the more it becomes a habit, until the first response is to head for the bike rather than grab the car keys. There's also an expansion of acceptable weather that happens gradually, until even a light drizzle is no longer a deterrent. Water, I discovered after a couple years of periodically biking around town, is not toxic, and there was a raincoat hiding in my closet that is actually designed to shed it. Such are the rediscoveries that await in the long process of shedding car-dependency. And then there is the fun aspect, which I discovered after reconditioning a trailer bike that someone had left on the curb (shop local). Get a kid on the trailer seat strong enough to contribute to the peddling, and the sensation is of flying down a sled run, or team rowing. Even if the cold weather discourages biking to school in the morning, I can still pick up my daughter with this rig in the warmed afternoon. For those who are of a practical sort, not apt to suffer unnecessary effort gladly, the concept of venturing onto a treadmill or a stairmaster remains an alien one. Perhaps there are primordial ancestors whispering through our genes, telling us to rest up for the big hunt, saying that exercise must have meaning and purpose beyond achieving a lively heart rate. Needing motivation beyond simple longevity, I seek exercise in riding a bike to get where I need to go, or chopping wood, or cutting down invasive shrubs. This is all well and good, as far as it goes, but it rarely gives the sense of having tested the limit, of cleansing the pores, of flushing out the stagnant byways of the circulatory system. To that end, I propose that someone of a mechanical bent devise an exercise bike that generates electricity. Domestic heroes, ready to take on global warming feet first, will trod down into the basement and spend a half hour generating an evening's worth of electricity for the family, and at the same time get that dose of intense exercise that a practical nature would otherwise deprive them of. Of course, someone already has, as a "bike generator" web search will instantly show. One fellow produced 90 watt hours this very morning on his homemade bike generator, enough to run a laptop for three hours. In this vein, a NY Times article, Taking People Power to a New Level, describes a way to generate electricity simply by taking a walk around the block. It attaches to the knee, and generates a steady flow of 5 watts. The article also mentions an invention that utilizes the jiggling of a backpack to generate 20 watts, more than enough to power whatever gizmos are standard equipment for hikes into the wild these days. Embedded in the text is a stunning statistic: A person's body fat stores as much energy as a ton of batteries. Hope turns up in the most unlikely quarters. Given its reputation, the nation may be sitting on the key to its energy independence. No matter how dazzling the mechanical skin we wrap ourselves in, the solar-powered self remains the greatest marvel, now apparently with sophisticated battery power second to none. Of all the houses I've lived in, this is the first in which it occurred to me to change the temperature control on the hot water heater. They're so quiet and unassuming, tucked away somewhere in a closet or the basement. If by rare chance you encounter it during daily domestic ramblings, it's not likely to give off that "Come and adjust me" kind of vibe. Turning the water heater back on after a long vacation, I happened to adjust the temperature control so that the hot water for the shower was consistently just right. No cold water needed. Just turn on the hot. Through this chance discovery, the hot water heater now burns less gas, and there's no longer a need to fiddle with the cold and hot water knobs before and during the shower. Not to say this will work in all homes. Serendipity may be playing a role here, involving the rhythm of hot water use in the house, but for the sake of some simplicity and economy, it's worth a try. Update, Feb/2012: This approach continues to work very well, for everyone in the family. The logic is that the hotter the water in the tank, the more heat is lost through the tank's walls, which means more energy needs to be applied to keep the water at that high temperature. This past summer, we left the water heater on low after returning from a vacation, and actually found the coolish showers refreshing during hot weather. Adendum: Electric water heaters may be a little harder to adjust, as the temperature adjustments are typically behind metal covers, and there may be separate adjustments for upper and lower heat coils. Lots of tutorials can be found via internet search, with this link as an example. Since electric water heaters are less efficient than gas ones at heating water, learning to adjust them is worth the extra effort. Compact fluorescents have come a long way, but they work better in some spots than others. Start with outdoor lighting that is on for long periods, and utility areas. I've been impressed with the fluorescent spotlights (though less advantageous for motion sensor lights, since the light is only on for brief periods), and have put the regular CFLs (Compact fluorescent lights) in enclosed outdoor fixtures without problems. For indoors, the light they give off is much improved, and can be softened further by using them in lamps, where the glass or lampshade will add yellow to their glow. Some people wait until an incandescent bulb burns out before replacing it with a compact florescent. My thinking is: Don't wait. Start reducing energy consumption now, and if you don't want to throw out a still-functional incandescent, then store it away, as a backup for those few spots where incandescents are more appropriate, for instance where a light is only used for a few minutes at a time. Compact fluorescents are cheaper than most articles say. Recently, I found both 60 and 75 watt equivalents selling individually for 75 cents each at Walmart (strangely, packages of multiple bulbs in another display in the same store were more expensive per bulb) (On a subsequent visit, the bargain display had disappeared--a "one time deal" according to one of the employees). The big box hardware stores usually have 60 watt equivalents for $1 each these days (As of 1/16, they are more like 3 for $5). The Kill-a-Watt is a useful tool for getting a handle on some of your energy use. It can test anything that plugs into a regular wall socket, up to 1850 watts. 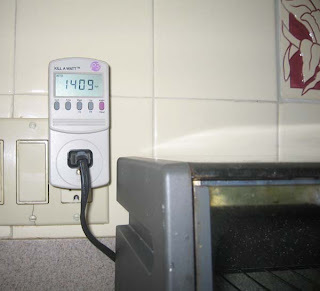 Here it is in action, measuring how much electricity a toaster oven uses. 1400 watts is 100 times as much as a florescent bulb uses, and about half as much as a small electric dryer. A toaster uses lots of energy but for a very short time. 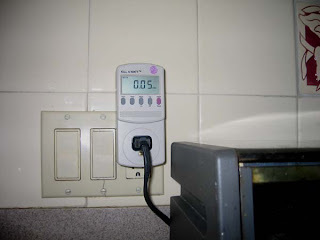 Press the red button on the right side of the Kill-a-Watt meter and it tells you how much energy the toasting of toast took--a grand 0.05 kilowatt hours. That's about one penny's worth of energy--about the same as having a 50 watt light bulb on for an hour. Obviously, toasters are not toasting the planet, but check other appliances and you're sure to find some unnecessary drains on energy. The device is particularly good for finding and measuring the energy used by electronics even when they are off. Here's a post for all those seeking validation for having delayed deep cleaning of the house, thereby increasing home biodiversity and allowing some unexpected species to join your Domestic Energy Reduction Team. Websites like EnergyStar and ThisOldHouse tell you that houses lose a lot of energy through leaks in the top floor ceiling. Light fixtures, ceiling fans, attic fan louvres, smoke detectors that run off house current rather than batteries--all can provide small openings for your heated air to escape into the attic. I've tried using incense to find these leaks (the smoke would supposedly show where the air is escaping), but the smoke is hard to see. An unexpected ally in a less than perfectly cleaned home turns out to be spiders. They seem only to build webs where there's airflow. Ceiling fixtures that are tight don't have them; ceiling fixtures that are leaking air into the attic do. Once you find the leaks, you can follow the directions on the websites to plug them up. Same goes for windows in the basement. Since electricity makes no sound, most people are in the dark about what is consuming electricity in the house at any particular time. Plug your computer, toaster, various power strips, TV and so forth into a Kill a Watt meter and you’ll undoubtedly find some unexpected energy drains. If you leave the appliance plugged into the Kill a Watt for a couple weeks, it will give you the total energy consumed in that time period, which will provide a good sense of how much the appliance uses per year. Newer All-in-One HP printer/scanner/fax/copier: 19 watts when on but not in use, 8 watts when turned off. It's called a dehumidifier, and it runs and runs. Mine is an Energy Star model, but that doesn't keep it from drawing what averages out to a constant draw of three or four hundred watts during the summer, and that's with it's thermostat set at the highest (70%) humidity level. A lower setting would cause it to run even more. Multiply that consumption rate by all the houses with basements, and you have a major contributor to energy demand, and therefore global warming. It may be worth looking into whether a ventilation system using fans that run on lower humidity days would achieve adequate results, simultaneously helping to reduce any risk of radon accumulation. Another measure is to make sure the ground slopes away from the house, and that downspouts discharge well away from the foundation, to reduce the amount of moisture seeping through the basement walls from the soil. My refrigerator uses 170 watts when the motor is running. To my surprise, it can occasionally use far more when it is dead silent. Whenever the defroster kicks in, its energy consumption jumps to 630 watts. Not much to be done about that, except to minimize the time the door is open, and maybe check the settings to make sure it's not running colder than it needs to. One thing to look for inside the frig is the switch that "reduces exterior moisture". This is a heating element that's supposed to keep the door from sweating. I turned it off, didn't notice any sweating, and thereby avoided the constant draw of 7 watts. The light bulb in the frig also produces considerable heat when the door is open. The DSL modem and router draw 9 watts combined. The TV/DVD/VCR draw 5 watts combined when not in use. Plugging these, along with printer and other computer peripherals into power strips that can be turned off reduces overnight consumption by about 30 watts. You can buy power strips that turn off peripherals automatically when the computer is turned off. I saw these on amazon.com, but have yet to try them. That's what they say about how comparatively expensive it is to heat anything with electricity. That little toaster oven on the kitchen counter, for instance, uses 1400 watts when on, nearly half of what the central air conditioner uses when it's cooling the whole house. Fortunately, toast is a quick operation. The hairdryer uses between 400 and 1500 watts, depending on the setting. The Kill-A-Watt wouldn't measure the electric clothes dryer's energy use, which turned out to be a mind-altering 3700 watts when measured with a whole house energy monitor called T.E.D. For comparison, a fluorescent light bulb uses 15 watts. The Kill-a-Watt has its limitations. It would not measure the microwave oven, which apparently uses more electricity than the Kill-a-Watt is designed to handle. As it turns out, the microwave uses 1900 watts, not bad considering how quickly it heats things. Any effort to cut back on home energy use quickly runs into a problem: our homes are designed to keep us in the dark about the consequences of our energy consumption habits. Though foods are labeled for caloric content, you'll have a hard time finding any label on your computer, dishwasher, water heater, or any other household item that will tell you how much energy it uses. Go on a diet, and you can get instant feedback on your progress by standing on a scale. Newer cars will tell you how many miles/gallon you're getting at any moment. But in a house, the most expensive item you're ever likely to own, feedback on energy use comes in tiny print, once a month in the mail. The electric meter is outside somewhere in the bushes, the gas meter is in a cramped corner of the basement, and their dials are hard to make any sense of. For the highly motivated, it's possible to track down devices to measure energy consumption on the internet. To measure my own use, I bought a Kill-a-Watt, which is a $25 handheld device that will tell you what most plug-in appliances in your home are consuming at any moment or over a period of time. It's very helpful, but not for measuring the big consumers, like the central A/C, furnace, dishwasher and clothes dryer. For those, I had to buy a $150 device that tells me how many watts my whole house is consuming at any moment. Though a number of home energy monitors are available on the internet, I ended up buying The Energy Detective--TED for short. Now I can turn on the dryer or any other item and see immediately how much my energy use jumps. I'm surprised how many people shrug at the notion that this sort of knowledge and instant feedback could have any impact on behavior. It certainly has changed mine. Note: Another post may go into this more, but the TED monitor requires either an electrician or some electrical knowledge to install on the circuit breaker board. Other whole house energy monitors, such as the one sold by Wattvision, can be easily and safely installed by anyone. The photo shows how the Wattvision meter wraps around an existing electric meter. Though most people are now aware that global warming is a problem, awareness does not necessarily spur a change in behavior. For me, a sense of urgency developed by degrees. A photo seen, an article read--all describing a radically changed world because of our consumption of ancient fuels. Oftentimes, matter-of-fact descriptions had a greater impact than high volume soundings of alarm. At some point--maybe it was a description of how our CO2 emissions are fundamentally changing the chemistry and ecological destiny of the oceans--I realized the status quo could not continue. Just as my sense of urgency was fed by quiet descriptions rather than loud pronouncements of imminent doom, there is another sort of quiet that can power change in our lifestyles. The silence I refer to in the title of this post has more to do with awareness than with sound. Right now, my computer is drawing nearly 200 watts, the refrigerator several rooms over is cycling on and off, using another 200 or so when it's on. The TV and cordless phone are drawing a few watts, even though they are turned off. Beyond that, things are pretty "quiet" around here. If I decided to use the electric dryer rather than a clothesline, the house would suddenly be drawing an extra 3700 watts! Though the dryer's quiet as a whisper, it's possible to "hear" this as a raucous noise of consumption. Fortunately, the clothes are air-drying, and if I turn off the computer, the house's power consumption gets quieter still. To be aware of this sound of silence is to relax in a new way. This awareness can be applied to your personal energy consumption at any moment in your day. Even though the street traffic may be loud, to walk or bike somewhere is to experience silence, whereas to drive a car is to hear a racket (consumption speaking), even if the windows are up. The impact each of us has on the world as we consume fossil fuels is abstract. But the evidence is in--our collective impact is real. As each of us comes to realize what is at stake, it's understandable if we all feel a growing sense of tension between our lifestyles and the planet's future. Develop an awareness, "listen" to how much power you're consuming, find ways to turn down the volume, and discover in this all-too noisy and abstract world a new feeling of relaxation that has silence at its core. I looked into getting solar panels for my home. The roof's oriented all wrong, and there are some big trees in the way. The solar rep, slow to yield to reality, suggested we put the panels in the backyard. I worried about soccer balls and various other errant airborne objects. That puts me in a group that in many parts of the country constitutes a majority, who by and large like the shade and don't have homes that will conveniently rotate to face south. After a few months of being discouraged, I realized that there are nonetheless large portions of my lifestyle that can be converted to solar power, without the substantial investment in solar panels. Begin with the realization that all of us are solar powered. The food that keeps us going carries energy harvested from the sun over the last year or so. True, it took fossil fuels to grow, process and transport the food, but fossil fuels are also consumed in the construction, transport and installation of solar panels. An array of panels on your roof might be dandy, but there are other ways of harnessing the solar energy within you and without you. The most retro of lifestyles can suddenly seem cutting edge when looked at from this perspective. For instance, most people already have a solar powered vehicle, better known as a bicycle. Steep hills somehow seem less onerous when you realize you're drawing your energy from the sun. An electric clothes dryer is one of the biggest energy hogs in your home (mine draws 3700 watts) and can be easily replaced by a solar-powered dryer, in the form of a clothesline or foldable drying rack. (Towels still go in the regular dryer, at least until the scratchy-towel-syndrome can be conquered.) 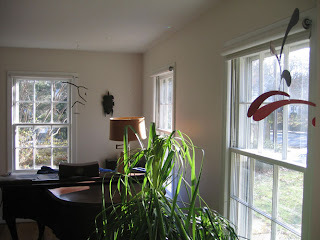 My solar powered lighting system (windows) works from sun-up to sunset. And a solar-powered dishwasher frequently takes on the pile of dishes on the kitchen counter. A vacuum cleaner (ours draws a hefty 1000 watts while on) is still handy for rugs and carpets, but a solar-powered broom works just fine for smooth floors. The body has solar-powered heating and cooling capabilities that can be optimized by matching clothing to the season. The solar-powered mind, too, can play a role. Though I doubt I could meditate naked in the snow, like Buddhist monks, I find my perception of comfort increases if I acknowledge that it is, in fact, summer, and maybe it's okay if the house feels just a wee bit warmer than during other seasons. Air conditioning can get consumed much like coffee. The first cup generates a vague appetite for more, whether it's needed or not. News articles come and go about research breakthroughs that will make solar panels more powerful and affordable, but we're all still waiting for them to turn into products we can actually buy. In the meantime, and it seems to be taking a long time, the solar-powered self is the best solar cell we've got. A vast deluge of leaves will soon be falling on Princeton, and the question is what to do with them all. For as long as can be remembered, most people have raked them into the streets and let the town scramble to clear away the resultant mess. Given how much homeowners pay in property taxes, it's understandable why people feel they should take advantage of one of this high-visibility service the town provides. But I would argue that this tradition is needlessly expensive, dangerous and destructive, and that there are alternatives that could easily be adopted by most homeowners without any aesthetic or physical sacrifice. Leaves that were providing nutrients for the trees, and protection against soil erosion, are blown by a hired crew out into the street, where they block traffic near a school, pollute the local streams and must then be hauled out of town at community expense. In other words, leafblowers are used to create a solid waste problem, requiring more machines to carry the leaves away, grind them up for industrial-scale composting, then haul the leaf mold somewhere for final use. In the age of global warming, it's hard to rationalize the extravagant consumption of fossil fuels this landscape practice demands. 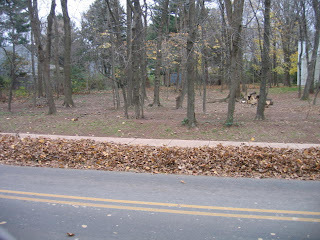 If the homeowner is not comfortable with the blanket of leaves the trees are trying to lay down for themselves, a much less harmful alternative is to place them in a wire corral in the back corner of the property (see post above). Increased Flooding: The annual mass removal of leaves from the urban landscape reduces organic matter in urban soils. This makes the ground less able to absorb rainwater, which increases flooding in local creeks. Water Pollution: Though it's not obvious from the looks of things, the streets we walk on, drive on and dump stuff onto are essentially dry creekbeds, directly linked to the town's streams. Leaves dumped in the street invariably get rained on, start to decompose, and then release nutrient pollution into waterways before they can be picked up. Energy consumption: If the township and borough are going to reduce energy consumption by 25%, in an effort to reduce the local impact on global warming, one place to start is by reducing the need for big rig caravans scooping or vacuuming up leaves along the street. In the borough, it's impressive to watch The Claw deftly scooping up leaves, but it burns a lot of gas, as do the massive grinders that triple-shred the leaves out at the Ecological Center. The export of leaves from town also requires burning more gas to then haul them back into town, in the form of mulch and compost. Safety: Leaves on the street force cars out across the center line, and can cause fires if hot mufflers or catalytic converters on parked cars touch dry leaves. Where there are no sidewalks, pedestrians and bicyclists are forced towards the center of the street. Blockage of stormdrains by leaves adds to these problems. Tree health: If we want to promote healthy trees in town, it's hard to imagine a happier tree root than one infiltrating the rich leafmold on the underside of a leafpile. Most properties with big piles of leaves out at the curb have room on their lot for a leaf pile that will quickly and dramatically reduce in size over the winter. Perhaps there's a way to mix education and an incremental change in policy that would allow Princeton to trade one tradition for another that makes more ecological and horticultural sense. Expense and diversion of staff from other municipal services: Leaf collection increases wear and tear on town vehicles and draws town crews away from other services they would ordinarily provide yearround. Leave Grass Clippings On the Lawn! This is the last place grass clippings should be. Placing them on the street sets them on a fossil-fuel-powered journey that includes hauling, multiple turnings in windrows, then hauling again as fertilizer to a new location. Much better to let them stay on the lawn, where they quickly decompose and feed new grass growth. If one neighbor starts dumping them on the street, other neighbors can assume that's what's supposed to be done, and soon the whole block is violating an ordinance intended to prevent high-nitrogen yardwaste from polluting the nearby creek via storm sewers. Sometimes, it's a misinformed landscape business that is first on the block to dump illegally. 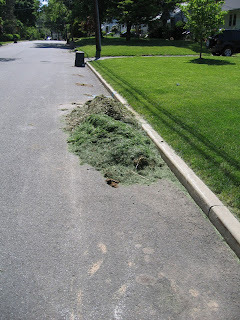 County extension agents tend to recommend leaving grass clippings on the lawn, such as on this website for Mercer County, NJ. If you don't, you're lawn loses valuable nitrogen that must then be replaced by buying more fertilizer. The worst thing to do with grass clippings is to pile them up. The high nitrogen and lack of aeration favor anaerobic bacteria that raise a stink if the pile is disturbed.